Happy 4th July festivities American people! 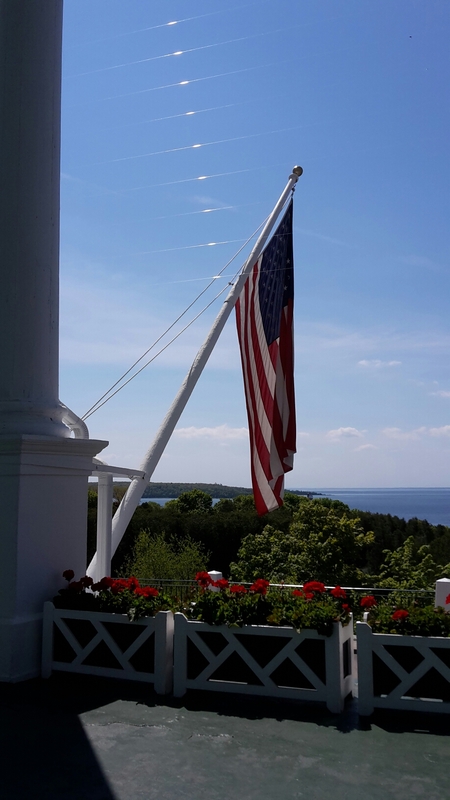 Taken on the front porch of the Grand Hotel, Mackinac Island. I’m currently in holiday planning mode. I should say that this is not at all unusual for me. I spend about 360 days of the year in holiday planning mode and plan, price and ALMOST book about 5 trips a month. I’ve just never been brave enough to take that step yet. I like a certain type of holiday. I’m no good at lying on a sunlounger or a beach, my concentration span is way too short for that kind of thing. I prefer to be up early and be out and about exploring all day long. I went a sunshine break with a friend last year and although I enjoyed the relaxation at the time, the thought of doing it again for a full week doesn’t really appeal to me. I’ve already had my London trip with my Mum and sister last month and I have another, solo, trip there planned and booked for August. I have a rough idea of things I would like to do but I’m waiting to see what the weather will be like nearer the time before making any set plans. Although I really should get the theatre tickets books soon to guarantee my coveted aisle seat! I may have mentioned in a previous post that I have a great love of TripAdvisor. I view the forums more than I view my social media pages and I have picked up a wealth of information from them. I did a search on the Solo travel forum for yoga holidays and it brought up a post with an option which I have head-over-heels fallen in love with. I 1000000000000000000% want to go. It’s a strange name for a hotel, I’ll give you that, but I just love the sound of it. It’s sunshine, it’s all inclusive, if I don’t want to leave the resort I don’t have to, there’s eating options, there’s drinking options, there’s an abundance of activity options, there’s a spa treatment every day…… I want to go. I have two weeks scheduled off work in November but it pains me to say I think that will be too soon for me to book this trip, once again due to cost. It will be close on £3000 and I doubt I can get this amount of money together so quickly. However, I am putting it on my list for next September. This year they have the month of September focused on solo travellers so I’m hoping they do the same next year and I can start putting some cash away now! So I need options for November. I have another trip I would like to do, but again I don’t know if cash would be available so soon for it. Four years ago I had a two week trip to the USA with a very reluctant travel companion. I spend 5 days in Las Vegas (should have been 6 but took a day out to travel to the Grand Canyon National Park and stay overnight) and I would love to go back and do some more national parks in the area. I wouldn’t rent a car by myself – waaaaaaaayyyyyy to stressful (someone ran into me in LA on that 2012 trip) so I would look at tours. I know, a tour, more expensive than driving myself and I’m on someone else’s time schedule. I am happy to do that though.British Airways currently have flights to Las Vegas for under £500 and I’ve found a 3 day tour by Bindlestiff Tours for their National Parks Winter Tour. I’d have a few days in Vegas either side of the tour and could all be done for about £1500. Which would be easy to do but I then have to factor in spending money. Now when someone hands me American dollars (normally the bureau de change worker) it’s like handing me Monopoly money. I lose all concept, and control, so I’d need at least £1000 for a week away. I may not spend it all but I’d like to have the option. There is also the option of simply a week in Vegas which I can do for about £800 and take a couple of day trips – Death Valley, Zion, that kind of thing. I’m clearly not short of options, I know what I want to do, it’s simply that I could lack cash by the time it comes around and right now I lack the bravery to go ahead and book it. Why am I afraid? Of what people will say probably. Will they say I’ve no friends to go with? (I do have friends – I just don’t want to go with them and they probably don’t want to go on that kind of holiday). Will I look sad and pathetic? Will I be lonely when I get there? Why do I care about what other people think? Anxiety. Back to that old chesnut. I’m going to work out some cash flow from the next couple of months wages and take my options from there. If anyone has any suggestions about any other holidays up to 10 days that may suit me as a first time proper solo traveller then let me know. I’m thinking USA or all inclusive sunshine, where if I want to stay on the resort there is plenty to do.